There is something mysterious about the invitation itself, both in the way it appears on paper and the strangeness of its content. It is a singular opportunity to embark on a journey to face her fears and have her most precious wish granted, and she’s only got until midnight to respond. As temping as it may seem, Hope would have loved to have nothing to do with the tournament, but then the hosts won’t let her have her way. She barely has time for anything, even her swim team and her studies, but she accepts the invitation and finds herself thrust onto Mount Olympus, where she faces the pantheon of Greek gods — her trainers. Hope has to overcome many challenges, each one more dangerous than the one before. Two things seem to make her stay — the desperate hope of having a cure for her mother and the gorgeous and shadowy god who tempts her in ways she can’t understand. Can she ignore the distractions and become the unusual contender in a tournament of heroes? Olympian Challenger by Astrid Arditi is a novel that will delight young readers and fans of Greek mythology. The author has succeeded in creating or recreating a world where men and gods walk side by side and where the drama among gods can be filled with more cunning than a human has ever known. The writing is exceptionally fluid, fueling the already well-paced plot with great use of dialogues and descriptions. The author weaves humor into the narrative, crafting a story with a powerful conflict and characters that are as real as can be, even in their encounters with the gods. Olympian Challenger is a gorgeous read, as exciting as it is well-told. Olympian Challenger by Astrid Arditi is the first book of the Olympian Challenger trilogy. Hope doesn't have time for fun, despite her best friend's insistence. How can she have time for parties between swim practice, studying, and caring for her mother? A mystery invitation arrives with the instructions to face her fears and she'll have a chance to have her deepest wish granted. This has to be her imagination, but when every other twelfth grader receives a similar invitation, it can't all be in her head. When she sees a stranger jump into the water, she risks her life to save him, but ends up being transported to Mount Olympus and told she's been accepted to be part of a competition sponsored by the legendary Greek gods. All she wants is to escape. When her attempts become futile, she has to find a way to win so she can return to her mother. With the help of her new friends and a strange attraction to a breathtaking stranger, Hope faces a series of quests that slowly reveal the true dangers and darkness behind the competition. Astrid Arditi pulls you into this stunning and dangerous world of myths and heroes, with a fresh take on Greek mythology. The quests are exciting, though very dangerous, because they're inspired by the heroes of Greek myths from Prometheus to Heracles. The competitors each have a unique reason for being there, though many are rooted in wanting a better life. Hope isn't like the others. She doesn't want to be there, and only wishes to return home to her mother. She quickly discovers this isn't possible and that the competition is her only way home. Over time, she discovers that being a hero isn't about the skills one may possess or about what fame can come from accomplishments, but about the heart behind a hero's actions. She helps others out of the goodness of her heart and is a genuinely kind person. This is what makes her such a strong character. The gods are spot-on with their typical behavior and portrayals from the myths, but Arditi has small twists that put fun new takes on the characters. Hope has a few distinct relationships throughout that make her a stronger hero and individual. Bellerophon is a hero who becomes her teacher and mentor, with an honest belief in Hope that helps her to keep going. Amy is a thief that doesn't trust easily, but she becomes a surprising friend and ally. Despite their conflicting personalities they form a strong friendship that makes both of them better for it. They also have a fun and sharp banter with each other that makes their scenes humorous, endearing, and at times emotional. Gabriel probably gets the most out of the competition, as he learns the value of love and acceptance, friendship and confidence. He has a sweet bond with Hope that makes every scene they share heartwarming and sincere. Romance shows up in surprising places, as Hope finds herself drawn to a mysterious stranger while Gabriel finds a chance at love where he least expects it. Olympian Challenger is so much more than a hero's journey; it's a coming of age story, a journey of self-discovery, a tale of friendship, and never wavers in its heart, love, strength, and emotion. An addictive read that you won't want to end. 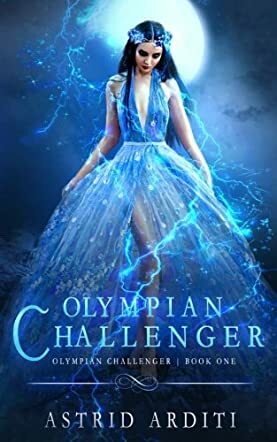 Olympian Challenger by Astrid Arditi is a powerful novel that melds together elements of Greek mythology, young adult, and the best that readers can find in fantasy. A superb swimmer, Hope barely makes time for herself or her school work. She tends to her sick mother. But her life is about to be changed and in ways she never expected when she gets an invitation to a mysterious yet exciting tournament. The problem is that everyone wants her in it. But she finds herself training with the pantheon of Greek gods on Mount Olympus. In spite of her skills, she’d do anything to get out of the tournament, but she is lured into it by the promise of health for her mother and the presence of an attractive god. The question is: can she face the challenges that await her in this adventure and how about the shady motives behind this tournament? For a trilogy, there couldn’t be a better opening than Olympian Challenger, a novel that is well plotted and written to perfection. There is a lot in store for readers — a well-imagined and rock-solid character for a protagonist and I loved that it’s a heroine, an exciting world where the gods are attributed the very natures of men and where they can be as demeaning as they are humorous, the nail-biting sense of suspense, and the great action. Astrid Arditi’s writing is fluid, filled with interesting descriptions and dialogues. She has the gift of recreating mythical worlds and making them into places of exciting adventures. The characters are very real and readers won’t find it hard connecting with Hope. This is an excellent read, thanks to the delightful prose and the memorable characters, and I can’t wait to discover what happens in the next book in this trilogy. The invitation doesn’t mean anything to Hope at first, but the longer she stares at it, the more it seems to say. Before she even realizes it, Hope has been sucked into a world that she never could have imagined. In fact, no one could possibly believe it because the very gods of Olympus are taking in a small group of 17-year-olds, looking for one who could possibly change the fate of the world, and earn their deepest desire at the same time. But Hope has only one wish, and that’s to save her mother from what seems to be a fate worse than death. In order to get her wish, though, she’ll have to excel at training, overcome the rest of the group and become a hero. Can she do it? Or is she destined to the uncertain future that awaits the losers of the competition in Olympian Challenger by Astrid Arditi. There is a whole lot going on in this exciting YA story, and you’ll find that there’s so much action you don’t know what will happen next. With characters like Hope, Kieron, Amy, Gabriel and quite a few more, you never know who is on what side, or who is going to win the competition after all. Each stage of the process requires a lot from each of the competitors, and it introduces you to some new characters as well, which definitely keeps you turning pages. Hope is the type of person that we all want to be; dedicated, strong, brave and loving. Her strongest and deepest wish is just to protect the ones that she loves and she’s willing to do anything at all to accomplish that goal in Olympian Challenger. Astrid Arditi has created a story in Olympian Challenger that is nothing short of delectable, easily pulling the reader into her world. It is a vivid and imposing magical world that is sure to excite many fans. Arditi's characters are instantly brought to life by her sharp, clever prose which teases out the most salient and defining traits of her characters in a plot conscious manner. Arditi's world lives, her characters breathe and the story is engaging. Fans of Greek mythology and newcomers to the genre will appreciate the skill and detail with which the author has brought Mount Olympus and its inhabitants to life. By juxtaposing them with our modern conceptions of morality, Arditi forces us to consider and appreciate virtues, ethics, and the richness of Greek mythology, and to reflect upon ourselves. With such skill and talent at the helm, the Olympian Challenger series is poised to get better and better with each release. It is a riveting page turner that will leave the reader eager for more, as much entertaining as it is edifying.